My husband had his teeth whitened at the dentist’s office and I was floored at the $500 price tag. I wanted to get my own teeth whitened but refused to pay such exorbitant prices. I was excited to learn more about SmileBrilliant.com, a national dental lab which offers profession strength teeth whitening product for use in the comfort of my own home. With prices significantly lower than our dentist’s office, I couldn’t wait to whiten my teeth using the Brilliantly Simple LED and Pen set. The Brilliantly Simple LED and Pen is attractively priced at only $39.95 as opposed to the comparable list price of $129.95. 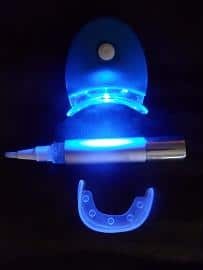 It works by using a high intensity Ultra-Blue LED activating light (it even comes ready to use with batteries included) along with a Professional whitening gel pen that has 35% concentration and protective trays for your top and bottom teeth. The first thing that I noticed is how easy and streamlined it is to use the pen as opposed to the messy tubes that my husband brought home from his dentist. This product is perfect for busy people because it is designed to work in just 20 minutes per day. My experience using the Brilliantly Simple LED and Pen is very positive. My teeth were noticeably whiter after the first use and continued to whiten over the next three uses. I was worried about my teeth becoming sensitive but did not have any negative effects during use. I could pop in the protective tray and LED light and read a book or watch a show while relaxing for 20 minutes and it was comfortable to use. Having whiter teeth has made me more confident and I find myself smiling more since I am no longer have embarrassing coffee stains. SmileBrilliant.com offers a 30 day money back guarantee and a life-time tray replacement warranty on this product. In addition to the Brilliantly Simple LED and Pen there are additional whitening options available for purchase to fit your needs. 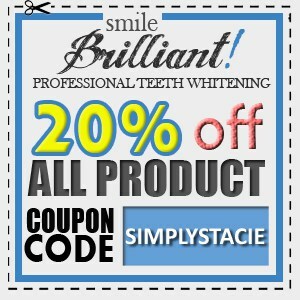 You are invited to visit SmileBrilliant.com to learn more about all of the high quality, professional strength whitening products or to purchase the Brilliantly Simple LED and Pen set now. Would like to try the pen. Seems better than the strips I have tried. I like that the gel is dispensed with a pen. Seems like that would be a lot easier to get the right amount! I would like to try the pen. It seems very user friendly. I learned that there is a lifetime tray replacement guarantee. I would like to try the Teeth Whitening Pen. Seems like a good product. I like that you make your own impressions, so its made specific for you! They have a lifetime tray replacement guarentee. If you lose your whitening trays, they will replace them for free. I was happy to see that SmileBrilliant removes even tetracycline stains which is rare! Custom-fitted bleaching trays (both top and bottom) produced by our dental lab to fit your teeth exactly. They offer a lifetime tray replacement guarantee! A Couples package is a good idea! I love that I could do this in the privacy of my own home.. I like that if you mess up they will ship you more materials free of charge. I’d like to try the Brilliant 12 Deluxe Teeth Whitening Package. I really like the couples package. I learned that even if YOU mess up, they will send more at no charge. I see that SmileBrilliant removes even tetracycline stains, which I have! i learned they offer a 30 day money back guarantee! I learned that SmileBrilliant! creates custom-fitted bleaching trays and professional strength bleaching gel.